Holy cats, I loved this book. It's the future. The area once known as North America is now the country of Panem, divided into 12 districts with the Capitol controlling them all. There used to be 13 districts, but years ago the districts rebelled against the Capitol and they were crushed. District 13 was utterly destroyed and as penance, each of the 12 remaining districts must send two tributes, a boy and a girl between the ages of 12 and 18, to the Hunger Games. The Hunger Games is a fight to the death, televised for the entire country and put on for the entertainment of the Capitol. There is only one victor and that teen will be rich beyond his or her wildest dreams. Some teens spend their whole lives training in the hopes of being randomly selected as a tribute for the Games. Teens in the poorer districts, with barely enough food to keep them alive, see the Hunger Games as a death sentence. This is the story of one of those tributes. I seriously, absolutely could not put this book down. It's hands-down my favorite book of 2008. And I can't wait for the next one. The world that Collins builds here is so real. Each time I picked up this book, I was immediately immersed in this totally scary dystopian world. There is a history here, politics galore, but never in a dry way. In fact, the whole book is action-packed. Twists and turns abound. One minute I would be laughing at something one of the characters did. The next minute I'd be tearing up. Riveting, riveting stuff. Do not miss this one. It's due out October 1. Thank you, thank you to Scholastic for providing this ARC through TeensReadToo. I literally squealed when I saw it in the mail. Need more convincing? Read reviews at Fuse #8, The Reading Zone, and Librarilly Blonde. Oh, and it got a starred review at The Horn Book. This book does sound awesome! It's definitely going on my to read list. 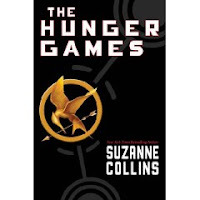 Is this the same Suzanne Collins that wrote the "Gregor" series? If so, I'll be looking out for this one. Marie, it is the same Suzanne Collins. And you should totally get your hands on it because it is awesome! I loved this book! I'm so glad there is some sort of a following this early on! it was awesome and I couldn't put it down, but that was because of how scary it was. It is said for 12 or 13 and up, but it's a game to the death...... a little scary, don't you think? This book was amazing. I couldn't put it down. A must read. I just read it today! That's right, one day to read it!! I was riveted to the book. It is impossible to put down. I loved the characters and I was dying to see what would happen next. I can't wait for the next one! I just finished this one and loved it! Thanks for writing a great review that made me read this!